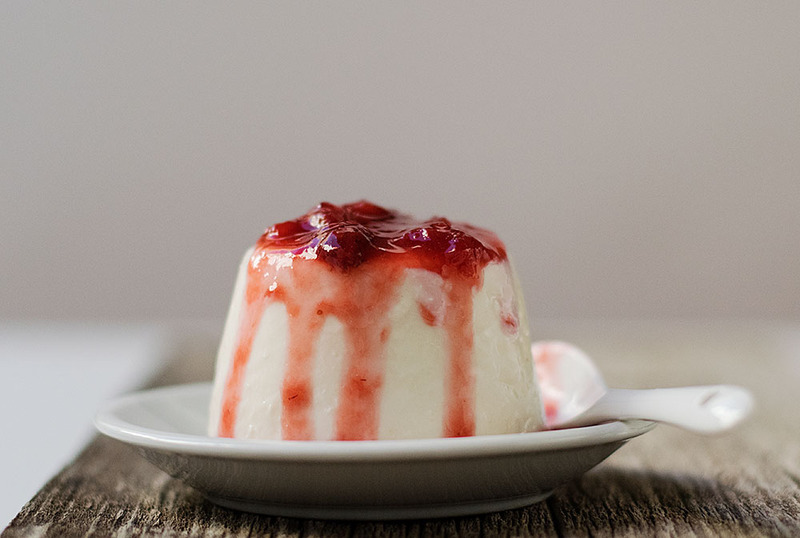 This low-fat yogurt pannacotta is healthier alternative to the famous dessert! I love panna cotta! I love its off-white color, indicative of purity and simplicity. 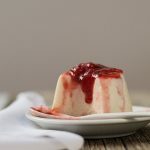 I love its creamy texture – when done right – which is the result of the minimum amount of gelatin required in order for the cream to thicken and be able to stand gloriously on its own while still remaining creamy and velvety with an unforgettable melt in the mouth texture. I love its wobbliness which betrays how fragile it is, and I love its warm vanilla aroma almost always accompanied by the fresh tones of a fruity sauce. Really, I love everything about panna cotta, except the high fat content! 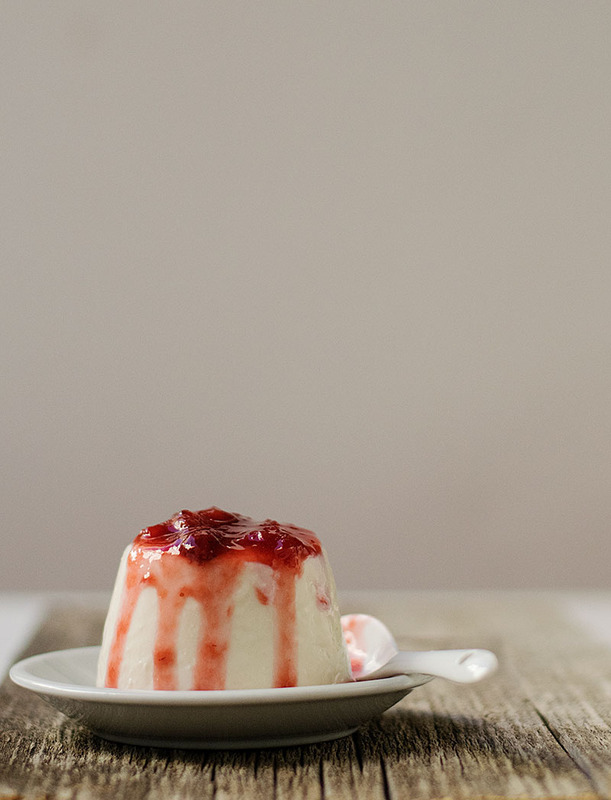 That’s why, today, I’m posting this yogurt vanilla panna cotta with almost no fat! OK, I’m not going to lie to you. If I had to choose between the real thing and a yogurt panna cotta, I’d choose the real thing. No, let me rephrase that… If I was on a diet for two weeks and one day had the luxury to overlook the extra calories, then I’d choose the real thing (or take a whole different road that leads to this pure chocolate mousse cake… Or this faux mille feuille…). But if I wanted something I could eat every day without much guilt, something that would even make me feel good inside (probiotics alert! 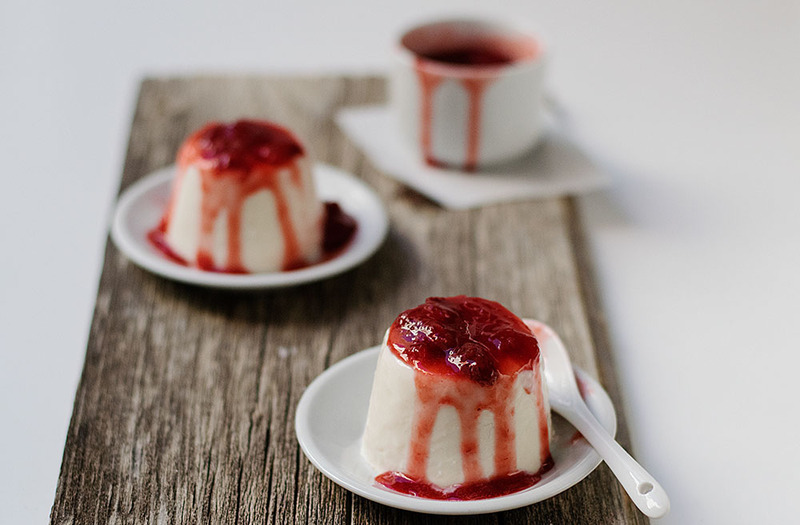 ), then I would definitely choose this creamy yogurt vanilla pana cotta. Super low in fat! This dessert has equal amounts of low fat yogurt (2.5%) and low fat milk (1.5%) which make it extra creamy and soft. 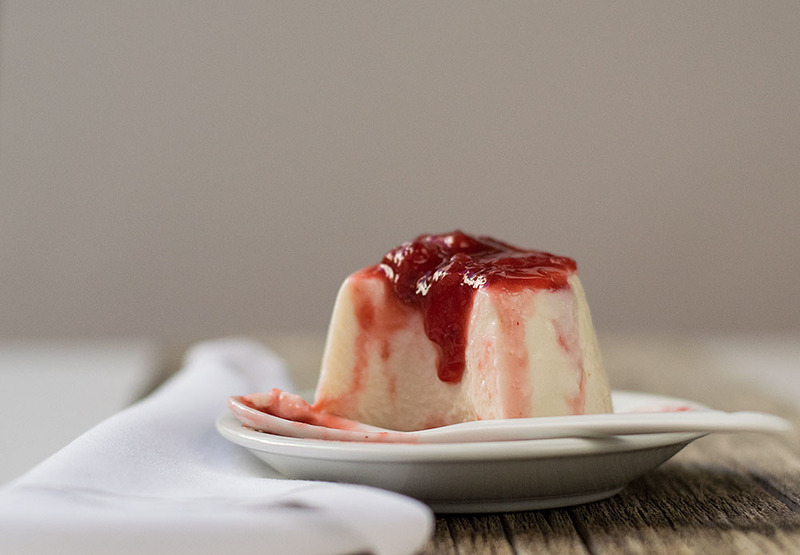 A 5oz (150 grams) serving – about half a cup plus 2 tablespoons – has 2.5 grams fat, while the same serving of a cream panna cotta has an average of 23 grams fat. Isn’t that a HUGE difference or what? Not to mention that because of the yogurt, each serving will give you about 8.5 grams of protein! You can even eat this after gym!!! Because yogurt is a little tart, some sugar and honey are used to balance it out. If you’re extra careful about your calorie intake, you can substitute sugar with your favorite sweetener with minor changes in flavor. Real yogurt has live culture with living bacteria called probiotics. These probiotics help us maintain healthy levels of good bacteria in our intestines, support our immune system, are very useful for anyone suffering from bloating, gas or flatulence problems. They also help to restore the good bacteria population in our guts after a course of antibiotics. Since they can be killed in high temperatures, we must be extra carefull and not overheat them when we use yogurt in our cooking. This recipe is ideal for this, because only the milk is heated and then added to the yogurt. Make sure you choose a real Greek, live yogurt! Real yogurt has no sugar, no added flavors and no gelatin! It thickens only by the power of the yogurt culture bacteria. So if you want the benefits of those probiotics, make sure there’s no gelatin or other thickening agents listed at the ingredients! 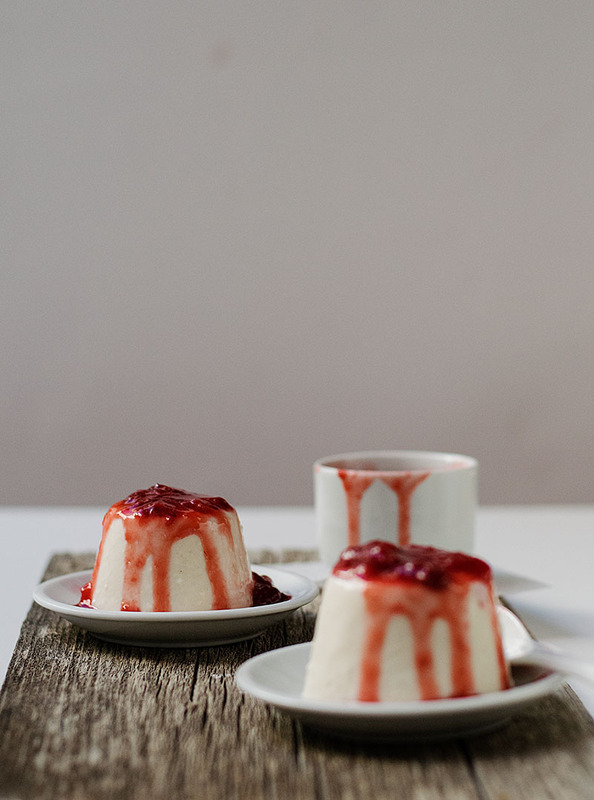 If you want to make your life even easier, serve this panna cotta inside ramekins or glasses without unmolding it! A healthier alternative to the famous dessert! Creamy, fragrant and wobbly, this refreshing dessert has almost no fat but still tastes amazing! Lightly oil 6 ramekins 6oz (180ml) capacity or 7 ramekins 5oz (150ml) capacity. You can also use silicon molds or glasses, whatever you prefer! In a small glass pour 2 tablespoons of the cold milk, add the gelatin, stir it to combine and let it bloom. Mix the sugar and cinnamon well (this will help the cinnamon not to form lumps). Heat the rest of the milk with the sugar until hot and the sugar has dissolved. Remove from heat, add the gelatin and stir until dissolved. In a bowl, mix the yogurt, honey, lemon juice, vanilla and salt. Add the milk in small batches, stirring well after each addition. Divide mixture into ramekins and refrigerate for 4-6 hours or until firm to the touch. In a saucepan add the berries and sugar and heat until sugar is melted and berries have released their juices. Mush them with a fork or a spatula and leave them to boil. In a small glass, mix corn flour and water. When the berries start to boil, add 1 tablespoon of the corn flour mixture and stir until mixture is glossy. If you want the sauce more thick add the rest of the corn flour and stir again for 1-2 minutes. Remove from heat and let cool. If you choose to unmold the desserts, run a knife through the edge of the molds and heat them briefly by dipping them half way for 10-20 second into hot water. Invert onto plates and help them unmold with the knife. Serve with some sauce on the top. Can I use a loaf pan?